Posting kind of late this evening (or morning for my friends already living in the future), but No Mine! Studios is now authorized to sell designs through Design By Hümans! Men’s and women’s shirts, phone cases, and prints are available in multiple styles and color combinations. As always, direct links to this and other vendors can be found on our main Shop page. 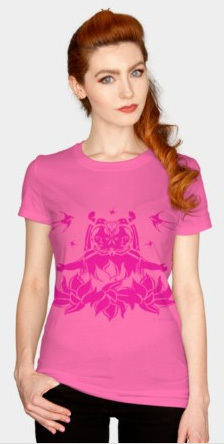 “Lotus (Pink)”. Suzanne Skaar. Women’s T-shirt. Available in multiple formats at Design by Hümans. Check back often for new designs, and please share with friends! Good night, sleep tight!/ Morning, sunshine!